There are times in life when only a diamond will do! If you’re about to pop the question to your sweetheart, you may be in the market for a horse themed engagement ring. May we present one of our favorites, the 14K White Gold Horseshoe Nail Ring. The White Gold Horseshoe Nail Ring shown features .55 cwt of diamonds, but you can choose a larger or smaller diamond to get the look and price that suits you best. This ring is extremely well made, high quality made in the USA craftsmanship that will stand up to even the most scrutinizing gaze – and what ring gets looked at MORE than an engagement ring? Not many! 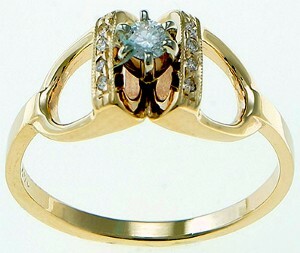 You can also choose this ring in 14K yellow gold. Another ring to consider if you’re searching for horse diamond engagement rings is this 14K Gold Horse Ring with a Center diamond. While this ring is available with other gemstones for the various months, when it is set with a diamond, it serves as an exceptional engagement ring. There are 14K carved horseheads holding the stone aloft – representative, perhaps, of the two of you and the precious love you share. 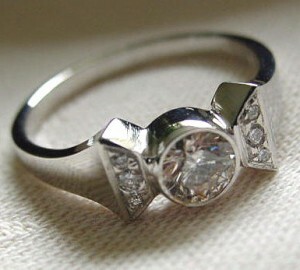 Here’s a great horse themed engagement ring. The 14K Gold and Diamond Stirrup Ring has a distinctive, open, elegant style about it – perfect for the sweetheart who appreciates classic lines and just enough sparkle. Pave diamonds surround a center stone for a total .33cwt of diamonds. A fine piece of magnificent diamond horse jewelry. If you’re shopping for an engagement ring, you may be wondering how much you should expect to spend. There are those who say you should expect to spend many months’ salary – in Japan, suitors are encouraged to spend four month’s salary on an engagement ring – but we’ve found that’s not a very realistic guideline, especially in a recessionary economy. Give yourself some flexibility, and concentrate on what’s important! We think it’s more important to find a ring that your sweetheart will love – nearly as much as she loves you!